Coat- This coat is actually my Mum's, which I stole for the day. 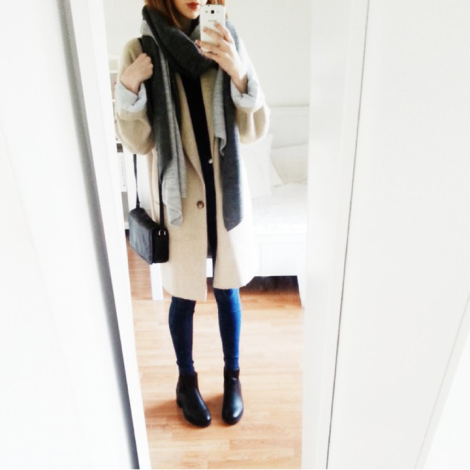 It's a camel coloured coat, which adds a bit of colour to my usually monochrome outfits, from Asos. I rolled up the sleeves, since they were actually too big, but I really liked the detail that it gave to the outfit. Buy similar here. Scarf- This scarf is also from Asos. It's a two-toned grey chunky scarf. It's super cosy but also helps to add some texture to the look. Buy similar here. Jeans- My Jeans are from Topshop. They are my favourite, the Joni Jean, in a dark denim wash. I find these Jeans great as they're high waisted and fitted, sucking you in in all the right places. Buy here. Boots- These Boots are from New Look. They are just your simple heeled Chelsea boot, giving me a bit of height as well as being really comfortable. Buy here. Bag- My bag is from TK Maxx. Just a simple black shoulder bag, perfect for everyday. Lipstick- Here I am wearing MAC's Craving, which I love. It's plummy toned and super long lasting, great for a day out. Buy here.